Have you recently gotten engaged and want to let everyone know? Why don't you throw an engagement party so you can announce your upcoming marriage and celebrate the fun with the people you're closest to? It doesn't have to be expensive or elaborate since the main event is sharing your excitement and joy with the people who matter most in your life. A lot of newly engaged couples like to share the news by having gatherings with family and close friends to announce and celebrate their status. If you want to have an engagement party, it’s generally best to do it before you start planning the wedding, or you might find yourself flapping around in a sea of preparation for your big day and wind up forgetting about it. Traditionally, the best way for couples to announce their engagement was at a party hosted by the bride’s parents. However, with social media and other rapid forms of communication, word gets out before the invitations can be stuffed, stamped, and mailed. This does not mean you shouldn’t still have the party. It simply means that the purpose of the party has changed. It’s more of a celebration than an announcement. Although the bride’s parents may still host the party, they are no longer locked into the tradition. Engagement parties may be held by any family member or friend. If you're the person hosting the party, stay in contact with the bride and groom throughout the planning to make sure their wishes are met. Don't spring any embarrassing surprises on them during the event. Immediate family members, close extended family, and the intimate circle of best friends should receive invitations to an engagement celebration. This is not the time to invite coworkers you only see at the office. Everyone you plan to include in the bridal party should receive an invitation to this event, unless they are long distance. You may still want to let them know about it, in case they have an opportunity to take an extra trip. This includes maid of honor, best man, bridesmaids, and groomsmen. People who are invited to the engagement party should also be on the wedding guest list too. Otherwise, you may hurt the feelings of those left out of celebrating the most important day of the bride and groom’s life. Most of the time, it's appropriate to have one party with everyone in attendance, but there may be an issue if the bride and groom's families and friends are from different areas. In that case, it's okay to have two separate events. If you have a single engagement party, do your best to have guests equally representing the bride and the groom. The preferred form of invitation is one that arrives in regular mail with a stamp and street address. However, for a less formal gathering, you may use email. Avoid using social media to invite your engagement party guests because you might hurt the feelings of others who are not invited, and this could create an awkward situation. Gifts are typically not given during an engagement party, and the host, hostess, bride, and groom need to make that clear in the invitation. However, some people may choose to bring gifts. Rather than display them on a gift table, thank the guest and place the gift out of sight. If you are invited to an engagement party, and nothing was stated on the invitation, you may want to tuck a gift card into an envelope so you won’t be the only person without something for the couple. Be very discreet when handing the gift to the couple. This is not the time to call anyone out on etiquette. The only activities or events that need to be scheduled for an engagement party are the announcement and toasts. In some cases, this is when the parents of the bride and groom meet. That should be done as soon as they both arrive at the party, without the interference of other guests. This is a time for the bride and groom to share the proposal experience and all of the guests to get to know each other. If you want to have an icebreaker, that's fine, but don't feel that you need to plan games or anything elaborate. Alcohol may be served if the families of both the bride and groom are agreeable. However, if either family has an objection for religious reasons or illness that would make drinking dangerous, there should be no alcohol. Keep the conversation light and focused on the happy event. When bringing two people together and blending families, you may encounter some differences that when discussed may ignite heated debate. This is not the time to discuss politics or vast religious differences. Keep the party small. Engagement parties should be intimate gatherings for those who are closest to the bride and groom. Too many people at an event without scheduled activities can be a disaster waiting to happen. Practice diplomacy. If anyone who may object to the union is invited, discuss the matter with him or her beforehand. The person doesn’t have to wholeheartedly agree with the decision of the bride and groom, but he or she should promise not to make a scene. This is a celebration and should be a very happy time without the couple being nervous about experiencing an awkward situation. Introduce the families in private. If the bride and groom’s parents haven’t met until now, don’t do the introduction in front of an audience. A private setting enables them to bond without interference and comments from others. Don’t overspend. Save the elaborate decorations, food, and entertainment for the wedding and reception. The purpose of the engagement party is a time to introduce families, officially announce the engagement, and offer toasts to the happy couple. Limit alcohol. 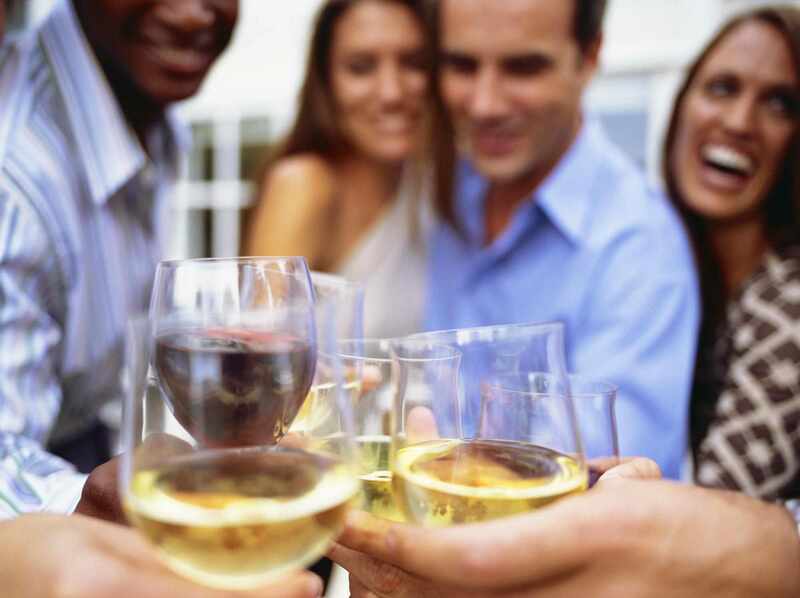 If you want to offer alcohol to your guests, it's best to limit the amount per person. One of the ways you can do this is to provide a single glass of wine, champagne, or signature drink per person for a toast. The engagement party can be very short and sweet since its purpose is to share your good news, toast your new status, show off your ring, and answer questions about the proposal. The main focus is the happy couple, so there's no need to provide other entertainment.